Asia is surging in US as well. The annual growth in US population, 2010-2016. The annual US population growth rate is about 0.7% for past six years based on the estimation by US Census Bureau. Although whites make the largest ethnic group, this group is the only group that has a negative rate of growth and is shrinking faster every year. 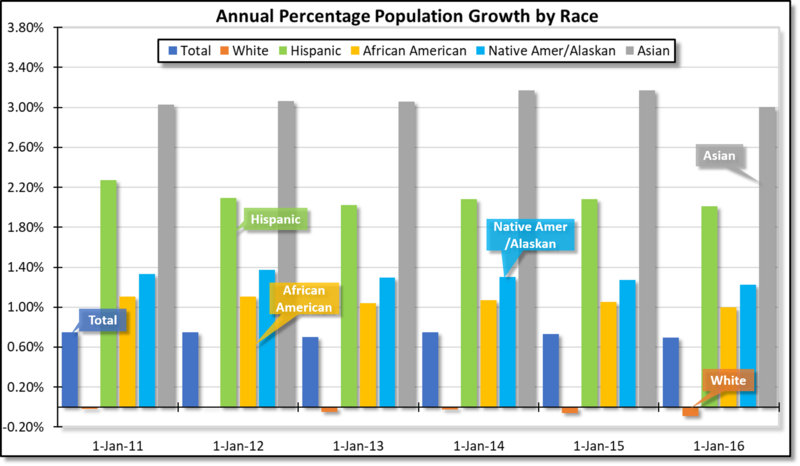 Other ethnic groups have a positive rate of growth with Hispanics at about 2% and Asians at approximately 3%. At the fertility rate of 2.09, US is slightly below the replacement rate of 2.1. Most of this replacement rate is a contribution of Hispanics and Asians, which are rising due to more children per family as well immigration.